For kids (young and old) who are serious about reading and looking for exciting, new books to read. Welcome fellow readers! I hope you enjoy some of the popular books I have reviewed for you. I hope you take some of these books into consideration. May your journey through the knowledge of reading be as exciting as life. Happy Reading!!!!! Mrs. Frisby and the Rats of Nimhby Robert C. O'Brien is a tall tale with a bit of a twist. Mrs. Frisby, a mouse widow, has three sons and two daughters and every year they move from a winter home to a summer home so they don't get run over by the plow. On one unfortunate morning, Timothy falls so sick that he can't go anywhere. The bad thing about this is that it is during moving season. So Mrs. Frisby has no choice but to pay a visit to Dr. Ages, Timothy's doctor. Dr. Ages give her the medicine but says that Timothy must stay in bed under all circumstances. He says that the Rats of Nimh will be able to help you move, but first you must visit the Owl. Mrs. Frisby must visit the Rats or they will be in teribble danger. Follow Mrs. Frisby on her wild adventure to what might be the only chance to save her kids. When I first heard of this book, it was my dad who actually reccomended it to me. He said that he had read this book when he was my age so I took it into consideration. When I started reading it, the beginning didn't make to much sense to me, but after a while I realized what a genius Robert C. O'Brien is. It has a great plot structure, lots of interesting characters, and many surprises that will blow your mind away. Every night, I would sit in my bed wondering what was going to happen next. 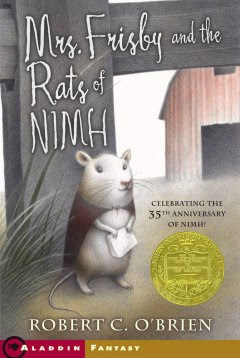 Mrs. Frisby and the Rats of Nimh is truly a book that will give you a reason to read. Would you give up half of everything you own to help people in need?